History of the Springs and Wells movement in the Malvern Hills, Part 3. The St Werstan Award for the improvement of the local water heritage had been announced in 2005 and this was destined to become an event that took place about once every year, depending on circumstances. The first plaque was awarded to Penny Cottage and Osborne's Fountain in January 2006 by a representative from the sponsors, Malvern Natural Mineral Water. In the picture the St Werstan Award is presented by Coca-Cola to the Malvern Community Hospital for their conservation of the Hospital Fountain. The Owls Hole Pump and Engine had been secured and restored. A garden party was held to demonstrate the vintage machinery and it became a regular annual event to have it running at the Worcestershire County Museum. Most importantly however was the programme of improvement for the springs and wells resulting from the Heritage Lottery Funding. A dozen or more sites were destined for improvements and the implementation of the plans was administered from the local Area of Outstanding Natural Beauty Office on behalf of Worcestershire County Council. The programme was not without its minor hiccups however. A restored water cascade outside St Ann's Well was named the Old Moses Spout after the local donkey that supposedly carried Princess Victoria up to the well in the early 19th century. She in fact rode her own donkey to the well. Her donkey was brought up from London. Other events that were important was the continued organisation of the annual well decorating. During this septennial it was to evolve into the largest annual event of its kind in the UK. The Well Decorating weekends were supported by the now legendary Coach Tours conducted by Cora and Bruce. Friends of Malvern Springs and Wells also decided to formally scrap the Well Wardens scheme because of the possible repercussions regarding public liability if something went wrong. This could involve anything from water contamination to personal accident or unanticipated damage to water courses etc. The Wardens were amalgamated into the Friends and the announcement made in Friends Newsletter 13 finally brought this difficult situation to a close. The former Wardens were able to maintain their interest as Friends but any site work had to be on a orchestrated on a formal basis. Following extensive original research and reinterpretation of early texts 'The Illumination of St Werstan the Martyr' was published by Cora Weaver and Bruce Osborne. This set out the founding of Malvern in the time of Edward the Confessor and how the first hermit had been assassinated in his cell near the present day St Ann's Well. The story was recorded in the 15th century windows of Malvern Priory and had been generally dismissed or ignored by previous historians. It was apparent that Werstan's choice of place to set up his cell had been related to the presence of spring water and as a result he was adopted as patron saint of Malvern Springs and Wells. The volume ran to a second edition in 2007. With the growing fame of Malvern Springs and Wells, the media found the theme of sufficient interest to take it national, with programmes like Countryfile visiting the hills with their film crews and local experts participating. Nick Crane, the high profile presenter of the Around Britain series worked with Cora and Bruce on a documnentary about Holy Well in which Cora appeared and which has subsequently been extensively screened. The early months of 2007 saw a change in the presentation of the Malvern Water brand of bottled water. Although subtle, at the time it passed almost unnoticed but in retrospect it was a signal of difficulties that were to have major repercussions in the future. The Schweppes bottling works at Colwall continued to employ about two dozen local people and the brand, which had Royal Appointment, not only was favoured by the Queen but also considerably enhanced the imagery and public awareness of the Malvern Hills and Malvern Waters generally. The brand had previously been recognised as a natural mineral water under the 1985 Mineral Water Regulations. This was a top level endorsement of quality which, after 2007, was to be superseded by a label that removed the mineral water classification; thereafter it was known as Malvern, The Original, English Water. One particularly important site to enjoy the benefits of the Heritage Lottery Funding was Clock Tower. Extensive restoration of the structure was overdue and welcomed. The water spout was reinstated and Tolkein-style gates put on the spout chamber. These created some controversy regarding their suitability for an industrial building. With hindsight they continue to perform their function and add a little decorative relief to what might otherwise be an austere building. It is always difficult to introduce ideas that are slightly 'outside the box'. An example is the sponsored labyrinth scheme for Rose Bank Gardens that in 2007 was promoted as a potential attraction for a neglected part of the gardens near the Mount Pleasant Hotel. The Council proposed a formal planning application, the preparation of which cost Friends several hundred pounds. After much pontificating and debate the scheme was dropped before the planning decision was made. The expenditure of several hundred pounds and substantial volunteer effort was to little avail. Meanwhile background research into the provenance of the springs and wells continued. Since 2000, Friends of Malvern Springs and Wells had been maintaining a database of research findings and new springs and wells sites discovered in the hills. This was eventually put on limited access on the internet and was only accessed where specific knowledge was required of sites and their history. What became apparent was that the number of known sites had steadily increased since 1992 and that a vast store of knowledge was largely publicly unrecognised, having not been formally published. A draft plan was formulated therefore to bring about the publication of a new definite work on Malvern Waters under the title Celebrated Springs of the Malvern Hills. Sponsorship for this major volume was essential if the new data was to be presented to the public. Summer 2008 saw the opening of the first new formal spa facility in Malvern for the first time in a century. The MalvernSpa opened its doors to the public providing a range of treatments and therapies aided by the provision of Malvern waters pumped from a borehole specifically drilled for the purpose. The spa had been built by local entrepreneur John Williams, but soon changed hands as the development of the business collided with the economic recession. Located in Townsend way, its car parks are generally well filled which is a good sign. Another project that was initiated by Friends of Malvern Springs and Wells was the George Bernard Shaw Mulberry Tree reinstatement. Shaw planted a mulberry tree in Priory Park Malvern in 1936, to commemorate his 80th birthday. In the year 2000 the tree, by then mature, came down in a storm and it was thought all was lost. Not so, it was discovered that a cutting from the original had been sent and planted in 1959 in Malvern, Melbourne, Australia and was thriving. A project was initiated, sponsored by Coca-Cola, to reinstate a mulberry tree in Priory Park. The cuttings arrived in England on the 14th August 2009 and are now being reared for their future role when they are planted by the Priory Park spring, where the original once stood. In the winter of 2009/10 there was an important event at the Holy Well. Following restoration of the building by the Humm family, they started bottling Holy Well water again. This was at a time when the market for premium brands was in decline. However the provenance of the local water made it an exciting project that saw bottled water again at the site where Schweppes had originally bottled 160 years before. In addition a visitor centre was opened at the Holy Well that was invaluable in not only maintaining the site in good order following earlier vandalism, but also aroused interest in Malvern Waters generally. Also February of 2010 saw the burning of the Tudor Hotel, Malvern's historic water cure establishment. The structure had been in a dire condition for many years and many feared that it would be lost. Efforts to encourage Danubius, the largest spa operator in Europe, to come to Malvern to establish a spa resort in the building and surrounds had been thwarted by the recession. Fortunately a local entrepreneur, David Habershon, stepped in and the buildings are now undergoing restoration for residential use. The year 2010 however will go down in history for another event that totally changed the Malvern Waters landscape. Coca-Cola announced that they intended to close their Schweppes Malvern Water bottling works at Colwall. This was after 160 years of bottling Malvern Waters under the Schweppes brand name. Various factions took different stances with regard to the closure. Some chose to attack Coca-Cola for their decision and to pursue a course of confrontation with a view to maintaining water bottling on site. After careful deliberation Friends of Malvern Springs and Wells decided that the most productive route forward was to interact with the bad news in a way that enabled Friends to salvage what could be of continued lasting value to Malvern and the Malvern Hills. In this respect we were privileged to work with Coca-Cola rather than take them to task as others chose to do. The responsibilities that Friends undertook included ensuring that archive material and artifacts survived for public use. These were duly collected and subsequently placed in the hands of Malvern Museum and suitable public record depositories. In addition the award winning Stone Bottle Fountain was removed and put in a safe haven, once it was announced that the Colwall site would be disposed of for possible residential development. Malvern Museum subsequently held a summer exhibition of the artifacts and Cora Weaver spent many hours interviewing ex-employees in order to collate recollections of people, many from families who had worked at the Colwall works for several generations. The Stone Bottle Fountain was subsequently installed in a purpose-built ornamental garden just inside the main south gate of the Three Counties Showground. On Thursday 10th May 2012, the bubbling, floodlit fountain was once again on display, in time for the Malvern Spring Gardening Show Gold Day. The fountain and its accompanying plaque were unveiled by the Bishop of Worcester. It is now a fitting tribute to 160 years of Schweppes bottling Malvern Waters. Inevitably the issues leading to the closure are debated extensively and there is little doubt that the viability of Colwall in recent years was based on the willingness of Coca-Cola to continue to invest resources into a business with an Achilles heel that could not be easily resolved, ie the water supply. Events outlined below, that took place in 2004 and 2005, can arguably be seen as leading to the closure 5 years later. 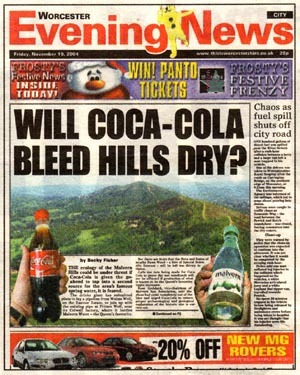 Coca-Cola drilling "will bleed hills dry". 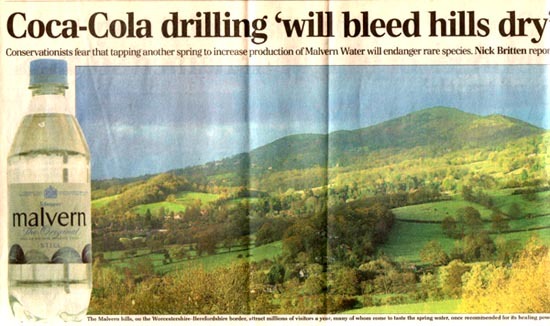 Is this the headline that killed off Malvern Water and the bottling plant at Colwall? (This expression was attributed directly to Rose Garrard, vice-chairman of the Malvern Spa Association in the Western Daily Press 22 Nov. 2004 see below). To recap, in October 2010, Coca-Cola Enterprises who operate the Malvern Water bottling works at Colwall, had announced that they were ceasing bottling and were closing the factory. This was after 23 years working with the local community to provide employment for about two dozen people and to perpetuate the 160 year old Schweppes Malvern Waters bottling tradition, brand and vintage bottling works. As Coca-Cola pointed out at the time, you need modern high throughput plant and facilities to compete in international markets and this means you have to have a prolific water supply, far greater than the modest Primeswell near British Camp. As people affected try to make sense of the scenario it is important to recall this recent history. "The level of water talked about is massive. We worry whether this amount of exploitation will bleed it dry." Local and then national media quickly took up the cause and a public debate worldwide ensued. It is worth mentioning at this point that the quantity of water talked about was minuscule compared with the total amount falling on the hills, and the aquifer would be unaffected. The spiralling media attention was halted when Dr Bruce Osborne, local author on the Malvern Springs and Wells and former Chairman of the British Natural Mineral Water Association, rushed to London to appear on Channel Four News and was able to defuse the situation. The result was that the TV news bulletin went off like a damp squib. In addition the Friends of Malvern Springs and Wells put out a number of expert statements in their Newsletter No 4 of December 2004 in an effort to promote a more balanced view (see www.malvernsprings.com). Unfortunately the damage was already done. <?xml:namespace prefix = "v" /><?xml:namespace prefix = "w" />Deeply concerned about the adverse publicity that they were receiving, Coca-Cola withdrew the Walms Well planning application, a fact announced in the media in early January 2005. 4. Worcester Evening News Jan.3 2005. Ms Carly Tinkler, the Malvern Spa Association Chairman in their Newsletter 15 of Winter 2005 recorded that following the headlines the MSA had swung into action: "We were pleased to hear that in January the application was withdrawn" said Tinkler. Other principal officers of the Malvern Spa Association at this time included R Garrard, J Bibby, R Roberts, J Black and J Harcup. The Friends of Malvern Springs and Wells followed this up with Newsletter 5 of January 2005 with a summary of what had transpired, commenting as follows. "Let us hope that this is not the beginning of the end for the last remaining bottler of Malvern Water, a tradition that can be traced back to the early 17th century." The dying controversy was also covered in the following Friends Newsletters 6 of February 2005 and 7 of March 2005, culminating in the following observation. "Let us hope that someone somewhere in the Corporate Affairs dept. 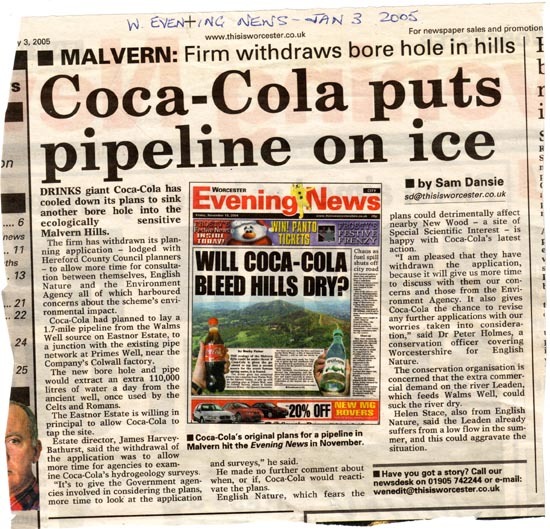 of Coca-Cola Enterprises does not consider the whole problem too much trouble and puts a red line through Malvern Water, thus ending a long tradition of bottling in the Malvern Hills." We can now see the prediction came true. It is apparent that Coca-Cola had water supply issues, deduced from the aborted Walms Well application. This was endorsed when they dropped the mineral water designation in 2007 (see above) and suggests that the water supply problems were a major factor. In the end the business was not viable and efforts to make it so had been detrimental to Coca-Cola's international reputation. The outcome was almost inevitable. Following closure the Colwall bottling plant site was put up for sale in 2011 and ultimately purchased by a property development company. The Friends of Malvern Springs and Wells, in conjunction with Coca-Cola, acted quickly after the closing to ensure that the historic Tank House became a grade 2 listed building, thus at least preserving the heritage building as a reminder of the demise of a Great British water after 160 years. Another controversial issue that attracted great media attention between 2010 and 2012 was the St Ann's Well tenant row. Under the chair of Ray Roberts (also secretary of the Malvern Spas Association in 2005 and thereafter) the Malvern Hills Conservators had endeavoured to get vacant possession of their premises at St Ann's Well. This prompted an outspoken campaign supporting the long standing tenant and the matter was supposedly put to rest when the tenant was eventually offered a new lease in 2010. Whatever side you took, the one inescapable conclusion was that the publicity was damaging and the affair was costly both in reputation and financial costs. However there then ensued an inquiry into how the situation had arisen. By January 2012 this was predicted to be costing thousands. On September 21, 2012, The Malvern Gazette front page headlines read 'Revealed, it's the shambles that shames conservators' when the results of the inquiry report became known. Such publicity does little for the reputation of springs and wells. 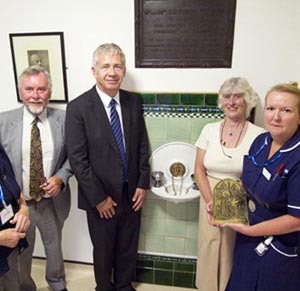 The Friends of Malvern Springs and Wells meanwhile pursued their various interests including the St Werstan Awards, one of which went to the Hospital Fountain, re-sited at the new community hospital in Malvern Link in 2010. This was one of a number of ongoing projects that continued to enhance the theme of Malvern Springs and Wells. In order to publicise activities generally as well as keep the Friends updated on progress, a number of web sites had previously been established. In 2012 the Friends amalgamated all of these under the general banner of MalvernWaters.co.uk a domain name used with the approval of Coca-Cola. As a result many new aspects of Malvern Springs and Wells became available on-line including the listing of the 130 sites. This also gave the opportunity to develop an on-line book sales facility following the closing of the local popular Beacon Books bookstore in town. In 2012 an event was to change the perception of the Malvern Springs and Wells forever. 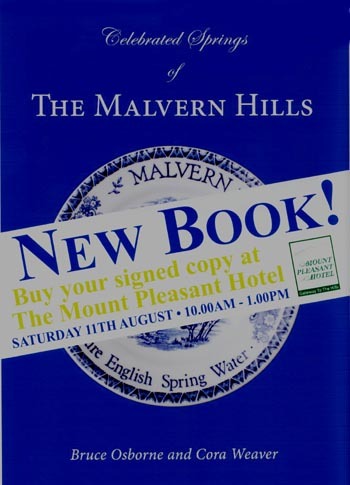 This was the launch of Celebrated Springs of the Malvern Hills, a new book by Bruce Osborne and Cora Weaver. This latest book was the culmination of 20 years researching the springs and wells of the Malvern Hills by the authors. As such it was the most comprehensive guide to the famous water sources and an important aid to visitors wishing to discover and explore the heritage of the Malvern Hills. The astounding and often long forgotten history of 130 springs, spouts, fountains and wells sites is detailed, together with information on what can be seen at the time of publication. Many sources were utilised for the Victorian water cure adding to Malvern's fame as an historic spa town. For centuries Malvern waters had also been bottled as well as drunk directly from the springs. The history of bottling and the famous brands involved is given in recognition of the contribution this industry has made to local communities and their springs and wells over the years. Published by Phillimore, the book is hard back with dust cover, large quarto size with lavish illustrations and extended text. Celebrated Springs contains about 200 illustrations and well researched text over a similar number of pages, together with seven area maps to guide the explorer to the locations around the Malvern Hills. This in turn gave rise to the creation of the Malvern Springs and Wells Discovery Trail by the Friends of Malvern Springs and Wells. Using latest technology such as QR codes the exploration of the famous springs and wells sites became formalised in two trails: one was around the hills and one around the town. As the third seven years draws to a close it is possible to summarise progress since the inception of Malvern Springs and Wells as a theme in 1992. 1. Well Decorating was initiated in the 1990s and is now believed to be the largest such event in the country. 2. There has been continuing national TV and other media coverage of the theme with Cora and Bruce appearing on programs such as Countryfile, etc. Also the local papers and radio frequently run editorials on the theme. 3. There are at least two specialist interest groups operating, including Friends of Malvern Springs and Wells, which is run by Cora Weaver and Bruce Osborne. 4. Cora's and Bruce's publications and supporting lectures, tours and presentations are well known and these in turn have led to the springs and wells of Malvern becoming a major tourist interest. 5. There has been a Heritage Lottery Grant of over a quarter million pounds to restore various springs and wells sites, now fully implemented. 6. The theme is supported by various public bodies including the Malvern Hills Conservators, Worcestershire County Council, Malvern Hills District Council, Malvern Museum, Malvern Civic Society, etc. These have all made available resources for conserving and enhancing the springs and wells theme. 7. There are numerous spin off projects such as the George Bernard Shaw Mulberry Tree reinstatement in Priory Park near the Mulberry Spring. Details of this and other activities can be seen on www.MalvernWaters.co.uk and in the Friends newsletter archive. This is accessible on the web site - see Newsletter Archives on the Index page. 8. The St Werstan Awards, sponsored by Coca-Cola, now promote the restoration and conservation of the sites and also commemorate this founding father of Malvern Priory as patron saint of Malvern springs and wells. As readers will appreciate the theme now has significant momentum. History of the Springs and Wells movement in the Malvern Hills, click below to go to the relevant time period.